Thanks to “The Golf Explorer” Magazine for featuring the Gerald R. Ford International Airport (GFIA) and its Viewing Park, which was designed by MMA, in their 2019 edition! Avenue SE in Grand Rapids, has served as a popular place for local residents, families, visitors, and aviation enthusiasts alike since it first opened in 1995. Initially a park featuring a long, serpentine-shaped parking lot and cul-de-sac with picnic tables where visitors could capture the drama of flight as planes roared down the East-West runway, the site has been transformed and elevated with a simple, yet carefully detailed structure designed by Mathison | Mathison Architects, or MMA, in Grand Rapids, Michigan. “This goes back to the primary kind of architecture: it is shelter. It has columns, the building is telling you what it is doing, it is directing rain, and it has this kind of purity as a structure,” said Ben Franceschi, architect at MMA. MMA, a full-service architectural firm grounded in modernism, is a practice striving to deliver projects that embrace its site, enrich its surrounding environment, and provide meaningful authentic experiences. Thomas R. Mathison, FAIA, principal and co-founder of MMA, indicated while the team was initially approached by Cascade Community Foundation to generate a concept, it was after considering the project’s potential to benefit the larger community that they began working with the airport to elevate the design a step further. 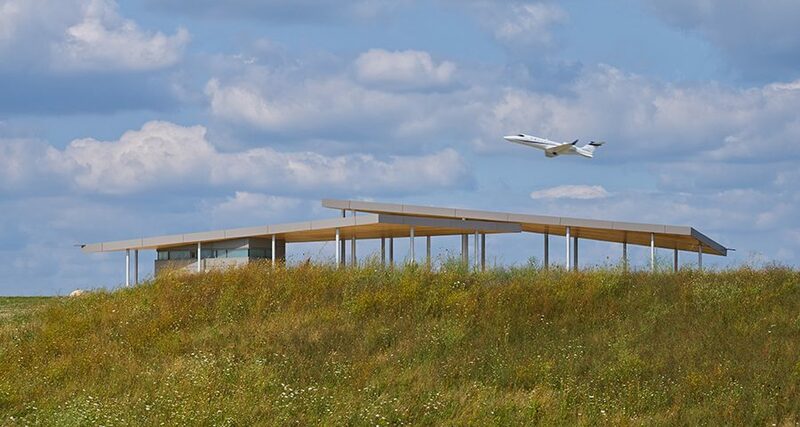 integrated programmatic elements into a central covered pavilion and restroom structure featuring ADA accessibility that would not only provide shelter and an engaging viewing space, but also serve as an aviation-centric teaching environment for local organizations and schools. scape and at a glance is a simple structure comprising double canopy roof forms of red cedar, interspersed columns, and a metal paneled bathroom facility set upon a brushed concrete plaza. Each element is carefully detailed and placed to ultimately capture the line of flight in dramatic statement set against the horizon. The roof form is as thin as possible and inspired by air foils and wings of aircraft; columns are cantilevered up from the ground; and gray columns are painted silver metallic to help dematerialize the columns and reflect the environment.